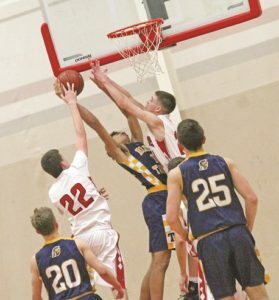 The Cardinals (3-3 overall, 2-2 Rock Valley) encountered a major scoring drought down the stretch in a tough 82-71 Rock Valley loss to Beloit Turner last Thursday. The battle was a seesaw affair all night with neither team getting major separation. With the score tied at 17, Brodhead went on an 8-2 run to go up 25-19 midway through the half. Senior Brekan Day ignited the run with a fast break layin off a Trojans’ turnover. Junior Dawson Van Whye weaved through the Trojans defense for a finish at the rim. Beloit Turner cut the deficit to 35-34 with just over three minutes left in the half. Trojans’ leading scorer Stephen Dillard torched the Cardinals defense connecting on two threes during the momentum swing. That would be a trend in this game.